Day 7 – Friday 9th August 2013 – Boarhills to Guardbridge via St. Andrews. – A coastal challenge with the most rewarding views. 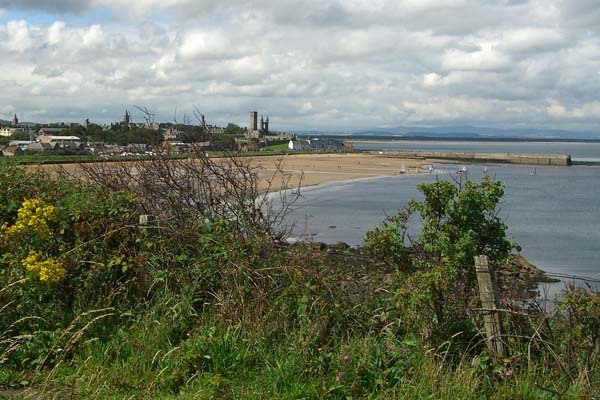 Steep ascents and tricky beach walks into St Andrews. The further you go on the coastal path, the more stunning the scenery, and the more challenging the conditions. Once again we were blessed with perfect walking weather, but the first half of the ten-mile stretch from Boarhills to Guardbridge still gave us food for thought. The overnight rain made parts of it marshy and soft, while clambering over the giant boulders on the beach required guile as well as strength, and the ascents to the tops of the coastal hills may have taken our breath away, but so did the views. The sun started to break through the clouds as we left the farmland of Boarhills behind us and began to spread out in single file along the path down to the beach. The tall vegetation either side seemed to soak the air out of the sky, making it hard going, and the first climb was a real test of our fitness – but after seven days of solid walking we all made it to the top. Ahead of schedule and on the fringe of the immaculately presented golf course at the Fairmont we scuttled up the hill for a treat – coffee, lattes, and teas all round! 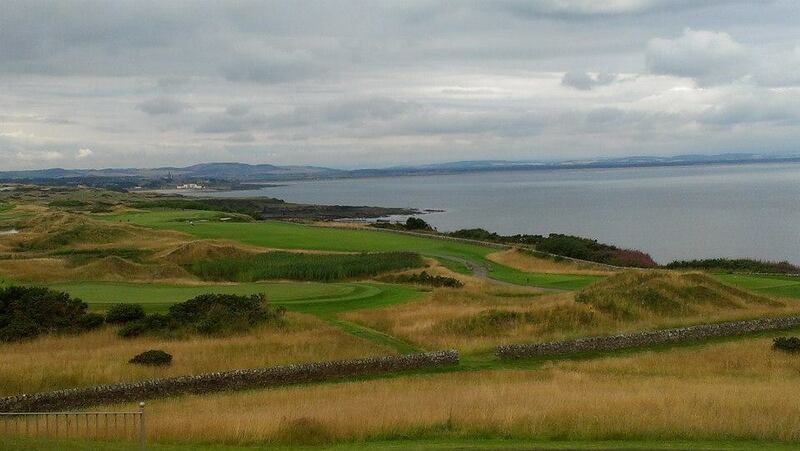 Refreshed, we headed past the 17th tee, over the stile and back on to the path for a long walk towards St Andrews. With the tide out we were able to scramble up and over the giant rocks and stick to the path before emerging at the caravan park and down into town. The view of the beaches was simply perfect – acres of golden sand with the white breakers of the waves seemingly miles away. We paused to allow a newly-wed couple emerge from a church before stopping at the benches which look down over the West Sands for our lunch. By the time we were on the move, the newly weds caught up with us for some photos. They then mirrored our route down into town and along the side of the Old COurse all the way to the hotel at the end – we did feel for the poor bride’s feet! Meanwhile on the world-famous Swilken Bridge another new Mr and Mrs waited for golfers to tee off before dashing on for their special picture. We were tempted to do likewise for a group photo…! The second half of the walk took us on to the path adjacent to the main road which was in complete contrast to the tranquility of the seafront. The trees did break some of the noise for the first half before they too ended, making conversation difficult as buses, lorries and cars roared past for the last few miles. We arrived at Guardbridge on schedule and then – and only then – as we unpacked did the first rain shower of the day, indeed the week, finally arrive. By then day seven was done. Ahead of us we could see Tenstsmuir Forest, part of tomorrow’s walk. 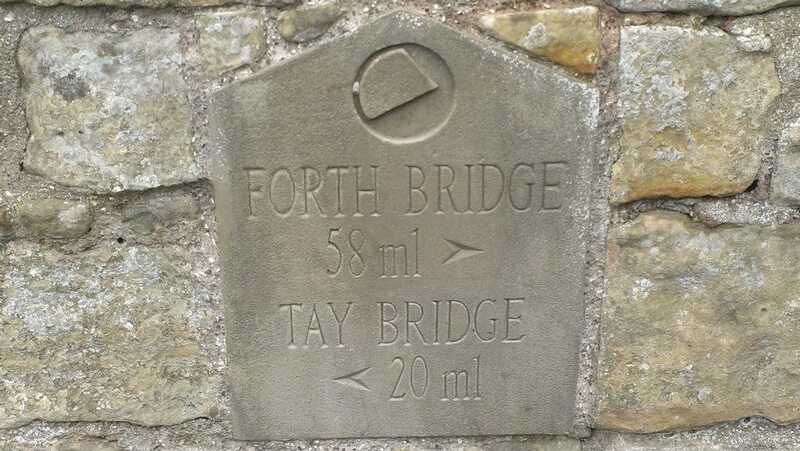 We depart the Guardbridge Hotel at 9.30 a.m. and follow the coastal path to Leuchars and Tayport. 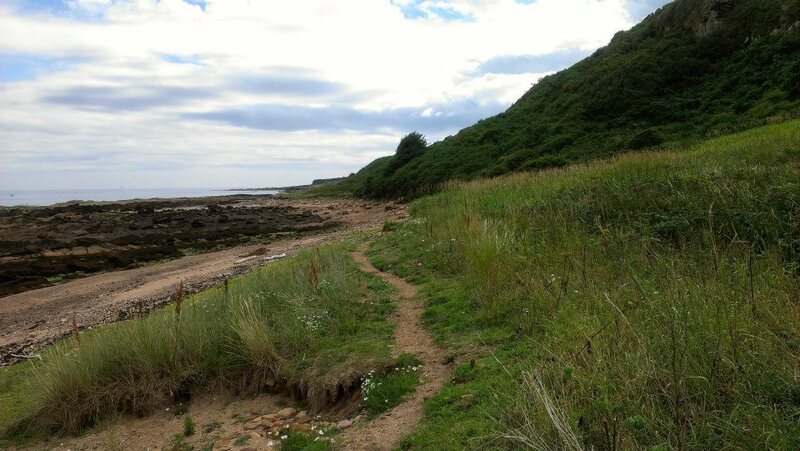 We then head into Tenstmuir Forest, arriving at Kinshaldie Beach for lunch around 12.15 p.m. In the afternoon we walk from there to Tayport Harbour whereb we hope to enjoy some of the village’s annual gala day on the Common. We follow the coastal path to the Tay Road Bridge and cross into Dundee. After lunch at the Discovery, we begin the final leg of our journey to Maggie’s Dundee in the grounds of Ninewells Hospital. We will be joined by our ultra runners and a ride out of Harley Davidson bikes as well as many friends and supporters who have joined us en route. Our estimated arrival at Maggie’s Dundee is 3,.00 p.m. – you are very welcome to come along and cheer us over the finishing line! If you’d like to join any part of the walk please you will be made very welcome. 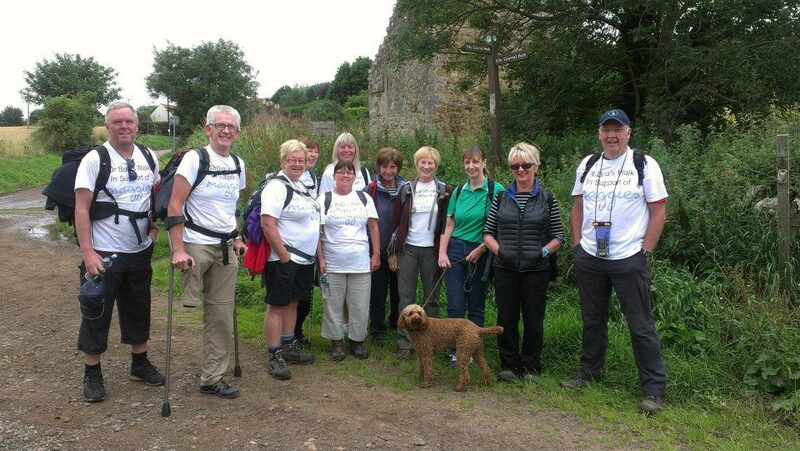 Please visit www.bobswalk.co.uk/bobs-walk-2013/ for further details.